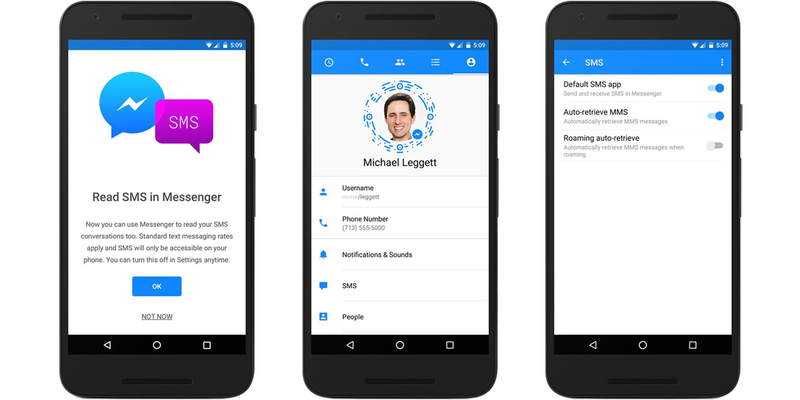 Facebook Messenger has updated its Android application with a new feature to directly manage not just the usual messages, but also received SMS messages through the social network. The new system allows you to manage conversations within a single application, without going continually from Facebook to another application (option currently only available on Android). • Establish Messenger as the default application for SMS. From the time of activation, all SMS messages will be incorporated into the Messenger application and may answer directly from the application, as long as an SMS. Facebook classic chats will continue to be shown in blue, while the use of SMS will be recognized for being purple, so that everyone is given more easily. In the SMS they can be, in addition to text, images inserted, video and audio, including emoji, and you can share your location. For other advanced features, such as sending GIFs and video calls features, it is mandatory to use Facebook chat through classic Messenger. If you enable this option, however, Facebook has almost nothing to do with your SMS: because it does not store or keep them on its servers; in fact, the telephone company manages the default SMS application on Android. This also means that SMS still costs the same as before, according to your tariff plan, while classic messages sent via Facebook fall in consumption data plan. Android offers for some time the possibility of a different application to configure your default application for SMS. Google, which owns the operating system, is trying for some time to integrate SMS into their systems chat, but without great results so far. The option is not available on iOS, the operating system of iPhone and iPad, since Apple does not allow a different application to control SMS.